My first reaction to having to watch yet another zombie movie? Ugh. I decided to swear them off after the rather toothless PG-13 version of "World War Z". And this is coming from an idolizer of George Romero’s early and much-imitated body of work. 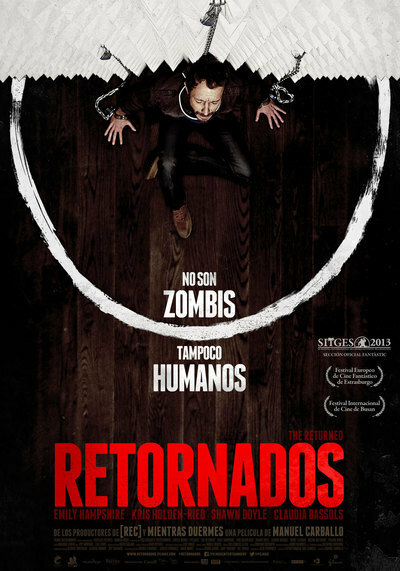 But it didn’t take long for "The Returned" to establish itself as having more ambition than just being another excuse for flesh-eating monsters to run amok while humans attempt to eradicate their organ-gorging kind. Instead, it is less of a horror flick and more of a suspense thriller with sci-fi elements that possesses both brains–some sacrificed in messy fashion, of course–and a heart, as it makes a statement about an imaginary social issue that reflects those conflicts facing our country today. Instead of, say, the haves vs. the have-nots or legislation against illegal immigrants, there is a battle between the healthy and the infected. A zombie outbreak that happened a while ago that caused millions to die has since been contained, thanks to a miracle of modern medicine. If caught in time, those bitten can receive a daily shot to stave off their transformation into snarling blood-thirsty fiends. These beings who find themselves in this human-zombie limbo are known as the Returned and not everyone is happy about their presence. Exemplifying this new normal is Toronto couple Kate (Emily Hampshire, a near-ringer for Parker Posey) and Alex (Kris Holden-Ried, a near-ringer for musician Richard Thompson). She is a doctor who specializes in treating the Returned and he is a talented guitar teacher who happens to be one of the Returned. That they live in a fabulous high-rise condo with ultra-modern furnishings and seem mad for each other lead us to believe that such a situation might work. Kate, who keeps her conflict of interest hidden from others at the hospital, over-confidently explains to the rightfully concerned parents of a young boy who must be injected every day for the rest of his life that, “Being one of the Returned is a privilege, not a curse.” Of course, she is just setting herself up to be proven wrong. Sure enough, the supply of antiviral serum is in danger of being depleted. Research is underway to create a synthetic variety but may not be available as quickly as first thought. The pending drought increases the opposition to keeping the infected alive. Some want to quarantine these stigmatized survivors, while others stage protests against their very existence. As matters worsen and violence breaks out as the stock continues to dwindle, Kate–who already was getting Alex’s supply under the counter–decides it’s time to they go on the run and hide out with the help of their supportive friends, who offer refuge at their remote chalet. From there, "The Returned"’s plot direction too often settles for being more predictable than its initial setup. I found myself thinking “uh-oh” again and again as the story took another expected turn. Hint: If you walk into an unmanned gas station in a zombie movie, chances are that noise in the back room is probably a sign to flee, not a reason to check out what is going on. But director Manuel Carballo offsets the lack of surprise with such efficient suspense builders as propulsive music, ambient noise, realistic lighting and judicious handheld camerawork while efficiently explaining the science and politics behind what is happening. What is most appreciated is the sense of everyday routine that he creates–you feel as if this could really happen right here, right now–and the fact that the sensitive, low-key performances by Hampshire and Holden-Ried keep the viewer invested in what happens to their relationship. "Warm Bodies" was one thing. But these are two adults trying to keep their love alive under horrible circumstances and it is compelling to watch. Carballo knows when to be playful–a judicious use of a clip from Bela Lugosi’s "Dracula" appears on TV just as the power goes out–and also understands when to be true to zombie lore. As he and everyone who has seen "Night of the Living Dead" know, a Romero-approved shot to the head is still the best way to stop a zombie for good.